Hello teachers out there in blogland! I have designed this blog to share ways to incorporate technology easily into teaching. I have a sincere passion for using technology daily in my classroom, and I hope to inspire some fellow teachers out there to embrace using technology on a daily basis. After all, technology is NOT going to slow down anytime soon! Throughout the coming school year I will be posting how I use technology to enhance learning and keep my students engaged. Hopefully, along the way, I will help some teachers out there become more comfortable with the "technology" word! For this first post, I thought I would share one of my favorite "plug-in" tools to use in the classroom. Last year, I purchased a HUE HD webcam after seeing it in action at the annual Upstate Technology Conference that is put on by my school district each summer. The HUE HD is a typical webcam, but what makes is so appealing? It has a movable stand that can be manipulated to act as a document cam. I had wanted an Elmo forever, but I just couldn't afford one of those on my own and budget cuts would not allow for me to have one either. In light of all of that, sometimes we teachers have to get creative. The presenter giving the session pulled this wonderful little gadget right out of her purse and started talking about how great it was for classroom use. Yes, that's right, she pulled it out of her purse. I love Mrs.Mauney. 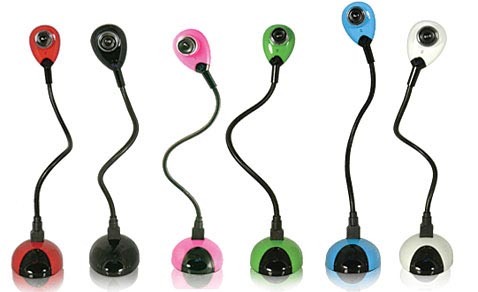 She also carries a flip cam in her purse, which I will definitely share the benefits of in another post. During the presentation the gears in my head started to turn uncontrollably. Not only could I use this fun little cam for a document cam, but I could also video my students, Skype with other classes, take pictures, and so much more. After leaving, I immediately sought out the HUE HD and found one on Amazon for $19.99. YES!!! 1. Skype with principal to share what we were doing in our classroom on a regular basis. 2. Skype with other classes. I am just as excited to use it this year as I was last year. I hope to video conference with other classrooms to have my students interact with other students on a more regular basis. I will keep you posted on how I use it this coming year. Love your blog! I will definitely be following! I can always use some technology tips!! Thanks for following! I will be following you as well. I hope you are having a great summer. See you soon! I am delighted to add another SC Educator to my Google Reader too!! Thanks for having me hang around in your blogroll! Feel free to pick mine clean. The theme is fantastic here too. Now, looking for me a HUE! Thank you Cathy! I have been following you on Twitter since a few UTCs ago. Then, I found your blog and I love it! I always learn something from you, and by the way, I am so with you when it comes to pamphlet stuffed conference bags! I love to learn about technology. Please include lots of photos on your blog that illustrate what you are talking about. That helps me so much. I'm very much a visual learner. I bought one of these on the website a couple of weeks ago, and have yet to get it in the mail! I really hope I'm not out of $50! I'd much rather it be shipped to me! How did you set it up as a document camera? I can't seem to get mine to work?